Historically, bricks and mortar casinos were littered with cumbersome slot machines lined in vast, unappealing rows. These were immensely popular with players, however, and this served as the trigger for the contemporary, online slots available through platforms like Titan casino. In some respects, it would be logical to assume that the emergence of online slots would reinforce the popularity of traditional units and fruit machines. This has not been the case, however, as modern day gamblers seem to prefer immersive, three dimensional gaming platforms rather than rigid slot experiences. Are Arm Bandits and slots being replaced? This is part of a wider concern for bricks and mortar casinos, which are struggling to contend with the flexibility, fluidity and diversity of online platforms. The cumbersome nature of physical slots and so-called one armed bandits is a central part of this issue, as they relate to a bygone age where gaming was entirely two dimensional and relatively restricted. This contrasts sharply with online gaming, where three dimensional design principles and real-time gameplay offers considerable unpredictability to players. To counter this, bricks and mortar casinos are looking at innovative ways in which they can compete with online platforms. One of the most recent changes has seen brands remove traditional slot machines from their premises, as they look to create additional space for fluid game zines with oversized popping dice, digital spinning Big Six wheels and virtual roulette. With the potential to also incorporate arcade style and augmented reality games, this is a significant drive that will create a more immersive experience for players and ultimately boost long-term revenues. 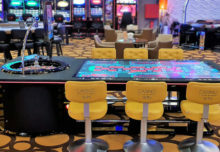 This is just one of the many ways in which bricks and mortar casinos are looking to compete with online alternatives, primarily by integrating elements of contemporary technology. With some casinos in America already accepting Bitcoin and video poker also making its debut in physical establishments throughout the western world, we are witnessing a changing landscape where players will ultimately benefit. This is especially true with the current change, which will replace low paying slot machines with more lucrative games and platforms. These changes will be witnessed in the flesh in the coming months, having initially made an appearance at the industry’s premier trade show (The Global Gaming Expo on the Vegas Strip). This means that the majority of gamblers will be able to benefit from these changes sooner than expected, as they look to capitalise on more lucrative games that also offer a higher rate of pay-outs. Given the perception that slot games are among the least generous in the world of gambling, this is a positive change that will offer incentive to players that are considering switching to the online platform.